Water ice from a subterranean ocean? Giant salt deposits from an alien mining operation? Since March, dwarf planet Ceres’ bright spots have mystified scientists, dazzled space nerds, and sparked all manner of wild speculation. A study published today in Nature has the answers we’ve been waiting for. Ceres, you are one fantastically complex beast of a space rock. To recap: NASA’s Dawn spacecraft has been capturing images of Ceres—the largest object in the main asteroid belt between Mars and Jupiter—since it began its close approach in December of 2014. By March 2015, Dawn had reached its first distant orbit around the dwarf planet (yes, Ceres, not Pluto, is the very first dwarf planet visited by humans). The spacecraft has continued to spiral into closer orbits ever since, snapping photos to create high-resolution maps of Ceres’ surface and using several on-board science instruments to probe its composition in more detail. As Ceres came into focus over the winter, we couldn’t help but draw our gaze to two prominent glimmering bright spots. As we crept closer, we realized that there were not just two of these mysterious features, but lots and lots. The largest of the bright spots, located in the now-infamous Occator crater, is around 6 miles (9 kilometers) wide—as Gizmodo’s Chris Mills notes, that’s large enough for an alien city. These things are big, and they are everywhere. So what on Earth are they? Now, in the most detailed surface analysis to date, a study led by Andreas Nathues of the Max Planck Institute in Germany argues that the mystery spots are actually a little bit of both—mostly salt, some water ice. The combination of these two ingredients probably comes from a briny ice sheet located somewhere beneath Ceres’ surface, one that gets excavated during impacts. We also have much stronger evidence for afternoon haze over at least two of the bright spots—a phenomenon that’s been witnessed over comets, but never over a rocky, asteroid-like body. Using their new camera settings, Nathues and his colleagues acquired high-resolution images of the entire surface of Ceres, allowing them to pick out numerous bright spots against an asphalt-colored background. All in all, Ceres bears over 130 glimmering splotches, ranging in brightness from that of concrete to ocean ice. Often, these features are associated with impact craters. Based on precise measurements of their brightness, we can now conclude that the main material in the spots is indeed a salt—more specifically, hydrated magnesium sulfate. While Dawn’s instruments were unable to determine the nature of the haze, independent observations by the Herschel Space Observatory confirmed the presence of water vapor. The most likely explanation is that ice is sublimating from the surface of Ceres under the Sun’s piercing, daytime glare, and settling back down in the evening. We’ve observed a similar diurnal haze pattern on comets, including everyone’s favorite 67P. What’s the source of this salty, icy, weather-making concoction? Nobody’s sure yet, but the occurrence of the bright spots in craters offers a likely explanation: a briny layer of water ice, buried not too far beneath the surface, possibly spanning the entire planet. “The simplest scenario is that the sublimation process of water ice starts after a mixture of ice and salt minerals is exposed by an impact, which penetrates the insulating dark upper crust,” the researchers write. For Nathues and his colleagues, the story is far from over. 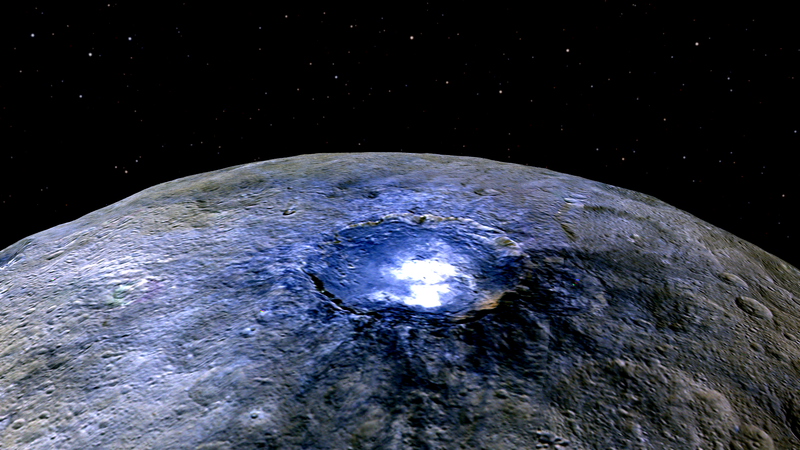 “What we know now is Ceres is partially differentiated—it has a kind of shell structure,” he said. The extent of that shell, and whether it originated somewhere deep in the planet’s interior, is not yet known. But more answers may be coming soon. Dawn is currently spiraling into its closest approach phase, a low-altitude mapping orbit (LAMO) that will position the spacecraft at a distance of 230 miles (370 km) above Ceres’ surface. It’s during this phase that scientists will be able to make gravity measurements and probe the interior composition of Ceres in much more detail. We’ll also be getting back some new, gloriously hi-res images during LAMO phase. Nathues and his team will use these images to continue studying Ceres’ surface morphology. There are fractures across some of the bright spots, and we’d like to know what role, if any, these features play in bringing briny material to Ceres’ surface. While there are clearly more details to fill in, it’s nice that we’re finally getting some closure on one of the biggest astronomical mysteries of the year. And in doing so, we’re revolutionizing our understanding of the asteroid belt at large. Rather than the inert, rocky graveyard we’ve been taking it for, the asteroid belt is shaping up to be a pretty fascinating place. Update (12/9 1:40 pm ET): This article has been updated to reflect a second Nature study on the likely origin of Ceres in the outer solar system.